Are you thinking about selling a yacht? 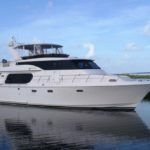 Experienced yacht sellers know that there are proven methods to sell their boat or yacht in an expedient way in order to obtain the best price. Many sellers go through trials and tribulations during this process, which can be frustrating and delay the day when it is ultimately sold. Here are some recommendations to speed up this process when considering selling a yacht. Symbol yachts have been built for more than thirty years and are well known for their heavy duty construction and beautiful interiors. This Symbol model was designed by the well known naval architect Jack Sarin, who custom built this yacht to handle areas such as the US coast and Bahamas in comfort and easy manageability with amenities commonly found on larger yachts!